Just a short ferry ride south of Davao City, in the Davao Gulf, is the island of Samal - officially called the Island Garden City of Samal - which is part of an archipelago of islets that offer a getaway from city life and some adventure activities. Samal is less than two miles (2km) from Davao City and can be reached by ferry or various boat services which leave from Sasa Wharf. Samal is the fastest growing tourist destination in the Philippines thanks mostly to its lovely beaches, calm waters and many coral reefs; the island is overrun by beach resorts but has not yet lost its charm to development. The island offers fabulous sunrises and sunsets and a fascinating topography of rolling hills, white sandy beaches and dozens of caves, which are popular with spelunkers and hikers. There are also some lovely waterfalls and natural swimming pools. 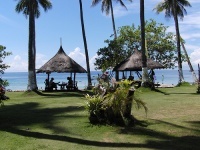 The beach is divided between the many resorts and there are lots of watersports and beach activities on offer. Paradise Resort is one of the most popular. The coastline has the usual coconut palms, mangrove swamps and coral reefs, together with some little fishing villages washed by clear, clean water.